They say conservative Latinos don’t care only about immigration. That’s true. But Trump is still winning those voters. It was fitting that Thursday night’s Republican presidential debate opened with a harsh exchange over immigration. The debate, hosted by CNN and Telemundo, was the RNC’s only sanctioned debate to air on a Spanish-language network. Immigration is the issue that has defined Donald Trump’s candidacy and the issue that Trump’s two Latino rivals, Ted Cruz and Marco Rubio, have spent the most time tussling over as they rush to prove their restrictionist bona fides on the topic. The only clarity the various exchanges offered, however, was that Cruz and Rubio are starting to get desperate enough to start saying Trump’s name when they criticize the leading candidate for their party’s presidential nomination. Right away Rubio set to challenge Trump on his marquee issue, highlighting Trump’s past support for legalization for undocumented immigrants. He also picked up where Ted Cruz had left off in a prior debate, highlighting the fact that in 2012, Trump criticized then–Republican presidential nominee Mitt Romney for advocating “self-deportation” on the campaign trail. “Even today, we saw a report in one of the newspapers that, Donald, you’ve hired a significant number of people from other countries to take jobs that Americans could have filled,” Rubio went on. Trump was the “only person on this stage” who’d been sued for failing to pay wages and benefits to 200 undocumented Polish workers. The underlying sentiment was one that Republicans who are sore about Trump’s dominance have been grousing over for months: that Trump is disingenuous and self-serving, that Trump is unserious, and, worst of all for Republicans, that Trump isn’t a true conservative. When Ted Cruz got in on it, instead of just forcing Rubio into a corner over his work on the Senate’s 2013 immigration reform bill, as has been Cruz’s favorite attack line, Cruz also attacked Donald Trump for playing boss on Celebrity Apprentice and for donating “over $50,000 to three Democrats and two Republicans” who made up the Gang of Eight—the silly moniker for the group that worked on the Senate immigration bill. Rubio has yet to advocate mass deportation, but if he did, he’d find a way to make it seem like he was doing it out of love for immigrants. But Rubio was just getting started. He later went in on Trump for demanding that companies who move their production overseas face stiff tariffs when importing goods even as the clothes lines which bear his name are manufactured abroad. “You’re gonna be starting a trade war against your own ties and your own suits,” Rubio said. Rubio moved on to the lawsuits Trump has faced over defrauding students of Trump University, a program that offered real-estate seminars. “I’ve won most of the lawsuits,” was Trump’s feeble reply. Rubio was in rare fighting form on Thursday night, except when the conversation came back around to his own positions on immigration. Telemundo moderator Maria Celeste Arraras asked Rubio to explain why, last April, he said that it wouldn’t be fair to cancel President Obama’s executive action allowing undocumented immigrants who’d come to the United States as children three years of protection from deportation, but last week, Rubio said he’d end the program on “day one” of a Rubio presidency. Rubio, ever masterful at expressing his increasingly hard-line immigration stances in gentle, and even soothing tones, keeps trying to have it both ways on immigration. He speaks the rhetoric of inclusivity for a new Republican generation populated, in his imagining, by people of color, even as he’s advocating policies that would in fact push people out of the country. He has yet to advocate mass deportation, but rest assured that if he came around to that policy position, he’d find a way to make it seem like he was doing it out of love for immigrants. He’s also, it should be noted, claiming to “cancel” the program by letting it run out for current beneficiaries. But Obama’s deferred action benefits run for three years at a time. Ending a program and also letting it expire at the same time would seem to be in conflict with each other. Rubio, despite his far-right views, is widely seen as the most palatable candidate to the Republican establishment class. Ted Cruz, as he’s fond of saying, is the only Republican presidential candidate who has beaten Trump in a primary. Together, the two represent the last viable hopes to beat an eventuality that’s looking more and more likely: Donald Trump as the GOP nominee. In other words, the current Republican race is between Donald Trump and two Latinos. That Thursday night’s debate took place in Houston, Texas, one of the nation’s fastest-growing cities and one with a population that’s 43 percent Latino, was not lost on the evening’s participants. The GOP has been alienating Latinos since long before Mitt Romney advocated “self-deportation” for the 11 million undocumented immigrants in the country. The two weren’t going to let that stop them from making the case that conservative Latinos exist, and that they’re willing to vote Republican. On that issue, Cruz and Rubio played tag team. “A lot of folks in the media have a definition of Hispanics that you can only be Hispanic if you’re liberal,” Cruz said. Cruz went on to mention that 40 percent of Latinos backed him when he ran for Senate. “We have to move past this idea that somehow the Hispanic community only cares about immigration,” Rubio later said. Both of these sentiments may have kernels of truth in them, but that doesn’t necessarily mean that either of them is the candidate most conservative Latinos want. 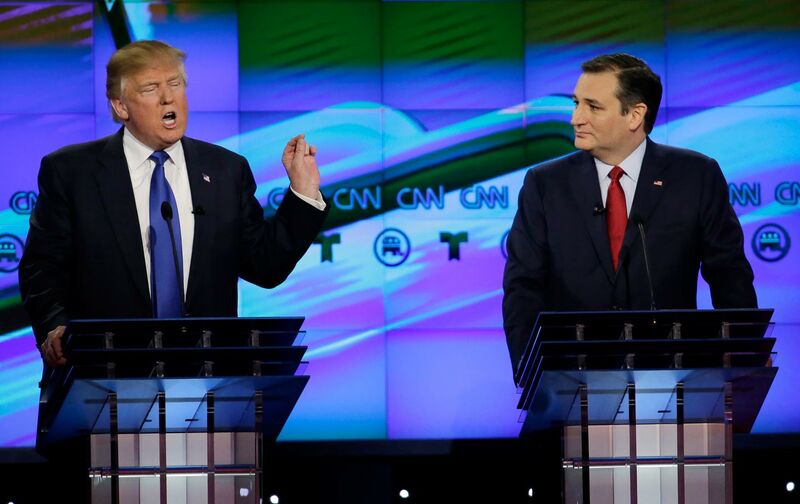 The debate came on the heels of Trump’s commanding win in the Nevada caucuses on Tuesday. Trump’s victory in the Silver State was no big surprise, but his win amounted to a walloping of Rubio and Cruz, who came in second and third, respectively, and took home, together, roughly the same share of caucus goers’ votes that Trump won on his own. Rubio’s campaign had billed Nevada as “Marco Rubio Country” at a Las Vegas campaign event on Sunday night, a nod to the years that Rubio lived in the city as a child. And yet, according to CNN entrance polls, it was Trump who was the runaway winner of the Latino vote on Tuesday night.